It is a strange feeling to be in Venice when the Biennale is not on, all my previous visits were in conjunction with my visits to the oldest established art festival La Biennale di Venzia. I have thought April would be a quiet time on the island but I suppose this place is never empty of tourists. 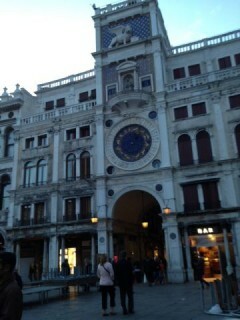 Venice is a great place to just wander though the walkways and passages without using the map for a while. After an hour of exploring you can check your location and you are never in the place where you expected to be. The small alleys with many turnings, canals and bridges feel like a labyrinth or maze. The sounds of the city are so different to Trieste (my previous Italian location) to start with, there is no traffic, so the sound of car engines and scooters is replaced with that of the vaporetto – the waterways buses and motor boats engines with the constant sound of the water splashing against the walls of the building and edge of the boats. The place is so much busier with tourists, speaking every language of the world, although Italian definitely dominates the streets at least in April. With such a choice of plazas and campos with bell towers and fabulous acoustics it has been a very difficult to decision where to record. 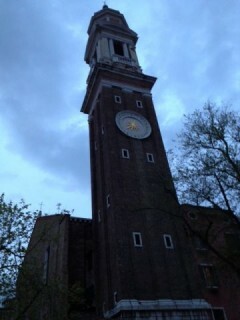 The hour for recording in Venice was between 7 and 8 pm. The evenings were still chilly but that didn’t stop locals and tourists hanging around the streets. I recorded an hour passing by on the Campo Dei Santi Apostoli with the bells of the church under the same name and of course an hour at the St Lucia train station. On the last day my hour recording was a walk thought the streets and allies, which I finish like a real tourist on Plazza San Marco. 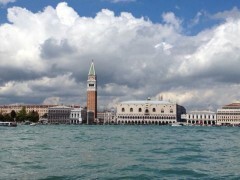 Venice is my last location during this journey. I will return to my recordings this summer to capture four more soundscapes of the cities for my clock. During this last three weeks it has been great to explore the eight cities on my route and to have time to focus my thoughts on the project. I would like to say thank you to my two assistants Frank Beavan (my husband) and Oliver Stawarski-Beavan (my 5 year old son). Also thank you to Rob Griffiths for capturing some sounds of Vienna with us. 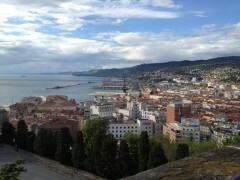 Trieste lies on the north-eastern edge of the Adriatic Sea it face northwest across fro the Iberian peninsula which on a good day allows a view of the snow capped distant Dolomites mountain range. The Trieste we see today began life as a sleepy coastal fishing village in the 14th Century, though its roots are in the Roman Empire. The village it allied itself with the Habsburg dynasty which was then building an empire across Europe. 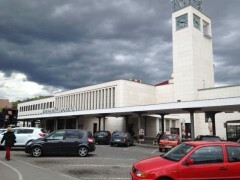 In 1719 Trieste was given the status of Freeport and it expansion began. A small canal was a created and large piazza and streets with villas for prosperous merchants were built according to a grid plan. Deep-water quays were built reaching out into the harbour. 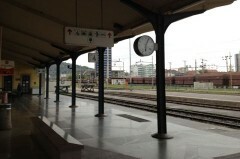 The railway arrived in 1850 and this marked a rapid expansion of the city becoming the main transit point for goods arriving from all over the Mediterranean Sea destined for central Europe. The city drew in a cosmopolitan mix of peoples from Germany the Balkans and the Mediterranean each leaving their mark on the architecture and the local dialect “Trestino”. The city today is a thriving vibrant working port with beautiful city centre and it is surrounded by mountains. 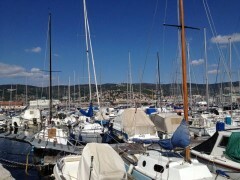 It was nice sunny weather for our stay in Trieste although the wind from the sea made the recordings sometimes rather challenging. I went for a walk in the harbour trying to capture the sound of the rigging of the yachts. I had to find shelter from the wind for my microphones within the port’s buildings, sometimes being stared by puzzled shipyard workers. 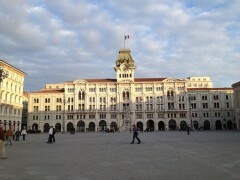 Trieste is a busy city; the sound of traffic in Italy is so different to northern part of Europe . High revving scooters the hum of the car’s engines punctuated by frequent short tempered beeping of horns, make a very satisfying sound recordings. We visited the castle built on the hill in the centre of the city and the Romanesque Cathedral di San Giusto with a bell tower with historic bells that are now to fragile to be used . We arrived to Ljubjana by car, we got a lift with Miha who I met last night at the Ex-Garage gallery space. Miha was on the way to Trieste to play in an artist’s football match. We only met at the station by chance and it was lucky coincidence. I was very impressed with his commitment to art and football to travel 216 km on a Saturday morning. 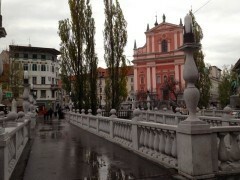 The journey was a great opportunity to find out more interesting facts about Ljubljana, politics and art in Slovenia. I was sad to find out how badly recent Slovenian government cuts had affected the arts and the public sector. 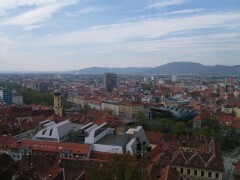 Ljubljana is another city that we have visited with a hill and a castle on the top (as Brno, Bratislava and Graz ). 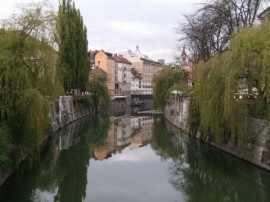 There is a river running thought the city too, which is much smaller then Mur in Graz or Drava in Maribor. The main square in the town is called Presernov Square, it is next to the river and the three bridges designed by Slovenian architect Joze Plecnik. The town is full of beautiful buildings and plazas and there are a lot green spaces in between. Surprisingly among the 5 story buildings you can find single story 19th century houses with triangular roofs. They look little bit out of a place in the city centre, as they look like they could belong to suburbs or villages. It was a pleasure to wonder around the streets with the recorder capturing the general ambience of the relaxed weekend in the city. Unfortunately Sunday afternoon rain made the outdoor recording much more complicated. 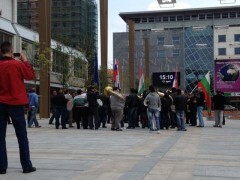 I think I captured enough for the project but if not I will be more then happy to return to Ljubljana again. We had a day and a half in Ljubljana and most of my time I had to spend on the streets recording, so I missed visiting all the museums and contemporary gallery spaces this town has to offer. The only gallery, which I managed to visit, was Metelkova Museum of Contemporary Art which opened in November 2011 http://www.mg-lj.si/node/60. 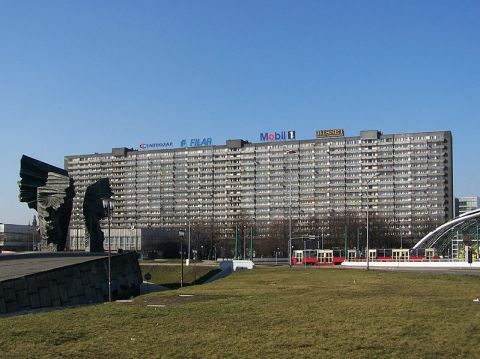 The gallery is built within a former Yugoslav Army barracks at Metelkova Street. In 1994 the Moderna Gallery Ljubljana was given the use of one of the buildings of a former Headquarters’ of the Yugoslav army within the Metalkova barracks to convert into a new Museum of Art. This new gallery would build its collection around avant-garde art created in Eastern Europe and later it formed the seed of a new Museum of Contemporary Art. My next destination Trieste is only 110 km away but I have discovered that there is no direct train route connecting these two cities. Unfortunately there appears to be a dispute between both countries rail companies, which has severed international rail links for the last few years. This means I will have to rise at 04:50 to catch a bus at 06.30, which I am really looking forward to. Maribor is the second largest city after Ljubljana in Slovenia with population of 95,200 so far is the smallest city on our journey. 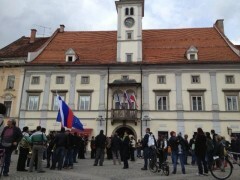 In 2012 Maribor is a European Capital of Culture, the city is decorated with flags and large balloons on the side of the road advertising this fact. It has been very easy to meander around the streets of the town and we felt that within a few hours we knew the city quite well. Wandering around I have recorded various sounds of: a railway station, almost empty of people but still full of vibration and the reverberated sounds of rolling stock idling at the platforms; sounds of an outdoor fridge generator; the general ambience of sound on the various squares where time was very slowly passing by and music of the Romani band who played walking around the town advertising the Gypsy Night event in a local bar. 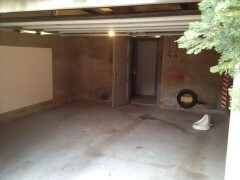 Labrovic in his performance walked into the space of the garage where the ceramic urinal was placed on the floor, he picked it up and did what a man would normally do with such an object, with the only difference was that the urinal was not connected to a wall or the sewage system. The performance brings the Duchampian ready made to it’s use in the gallery environment. As Duchamp brought the ordinary everyday object which is connected with everyday necessity to the state of the art, Labrovic brings the everyday bodily function to the same level. Central Europe and the Balkan’s states have gone through so many political and social changes in the last 80 years but at the same time the every day cycle of life has to remain the same. To me although Labrovic performances work on so many levels this is how I read this piece in context of my journey. It has been great to meet artists running the gallery space Metka Golec and Miha Horvat and artists attending the opening. 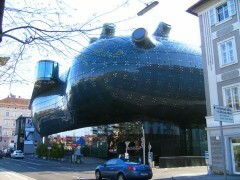 In between looking for sounds in the streets of Graz I have decided to have a closer look at Kunsthaus Graz; an extraordinary building designed by London architects Peter Cook and Colin Fournier, standing on the bank of river Mur. The oblong dark-blue structure juxtaposed against the read tile roofs enhances beautifully the skyline of the city. 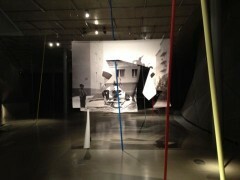 Sofie Thorsen’s work was presented in the exhibition Space02. Thorsen’s work investigates how we perceive architectural places when we see them for the first time? She is interested in spaces where the stories of past and present are connected within the identity and representation of the place. 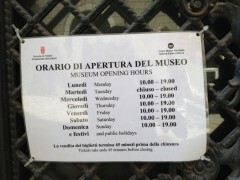 It is a shame I had a very short time to spend in both of the exhibitions.